Home Expenses What is Capitalized Expenditure? Capitalized expenditure is nothing but a revenue expenditure which is essential to acquire and function a new asset or improve an existing asset’s earning capacity. All such expenses are treated as if it were for the purchase of the fixed asset itself and are termed as capitalized expenditure. 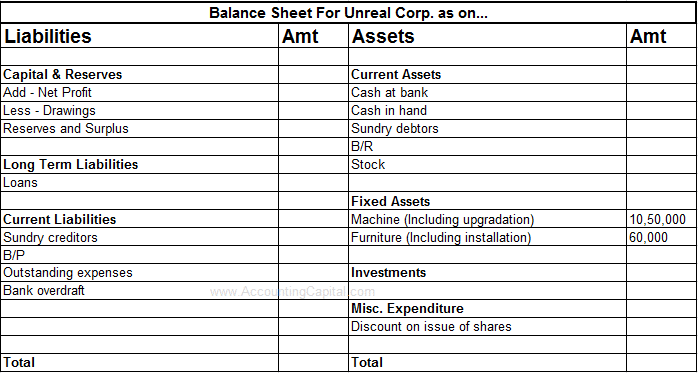 All such expenses are added to the cost of the related fixed asset and are shown on the balance sheet, whereas all revenue expenses are shown in the profit and loss account (income statement). An expense is said to be capitalized when its benefits do not expire in the same accounting period or in other words, same accounting year. Example of expenses which are capitalized – Purchase of a fixed asset, the installation cost of a fixed asset, upgrading a fixed asset, the legal cost incurred to acquire the fixed asset, etc. Related Topic – What is Capex and Opex? Reason – If a revenue expenditure extends its benefits for more than one accounting year such an expense is capitalized, furthermore, any expense which expires within the same accounting year is treated as revenue in nature. All capitalized expenses are written off in future accounting periods with the help of depreciation of fixed assets. All these items are examples of capital expenses incurred by a business. Installation and upgrading cost incurred are treated as capital expenses and added to the book value of machine and furniture respectively.